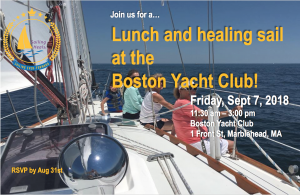 Lunch and healing sail at the Boston Yacht Club! This healing sail is full at this time. * Priority goes to patient guests who have experienced cancer or another serious medical issue within the last 2 years. * Patient guests are encouraged to bring a friend or caregiver. Additional guests may be welcome upon availability. * Registration does not guarantee a sail but we will attempt to accommodate as many patient guests as possible. * If weather conditions are unsafe for sailing, you will be notified in advance of the sail. Otherwise, please dress appropriately for sailing and weather conditions.